In celebration of Serena Williams’ history-making 23rd Slam title, NikeCourt and Jordan Brand present two color versions of the exclusive women’s NikeCourt Flare. Additionally, the celebratory pack includes the AJ1 SW collaboration, complete with Serena’s personal logo on the tongue and heel. The NikeCourt x Jordan Brand commemorative box is adorned with Jordan’s iconic Jumpman on the left lid and Williams’ “SW” logo on the right. Beneath each lies graphics which underscore the two champions’ shared athletic achievement. Under the Jumpman lies the number ’23,’ the symbolic tie between MJ and Serena. Additionally, six words (one for each of MJ’s championships) — creative, determined, innovative, classic, performance and stylish — appear as reminder of both athletes’ winning mindset. Beneath Williams’ logo is a flowing pattern highlighting her career. It is intentionally unfinished, allowing for Serena’s drive for continued success. The SW x Air Jordan footwear collection launches January 28 at Nike Soho. Both colorways of the women’s NikeCourt Flare AJ1 release January 30 on SNKRS in the U.S., Western Europe and Japan. 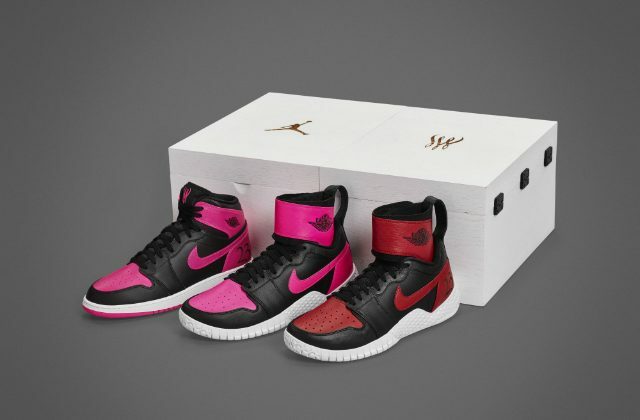 The Girls’ Air Jordan 1 Retro High SW is available January 30 from nike.com in the U.S. only.